June 19, 2013 -- The New York Sea Grant Launch Steward Program has expanded to include Sodus Bay, the largest sheltered bay on Lake Ontario. A popular recreational and tourism area, Sodus Bay is an excellent place for the New York Sea Grant Launch Steward Program to be educating the public about the importance of preventing and slowing the spread of harmful aquatic hitchhikers. Throughout the summer, the stewards are offering on-site watercraft inspections and collecting data on boater awareness of aquatic invasive species (AIS) here and other launch sites along the Eastern Lake Ontario shoreline. With an average depth of 18 feet and a maximum depth of about 48 feet, Sodus Bay provides habitat for fish and other freshwater aquatic organisms. 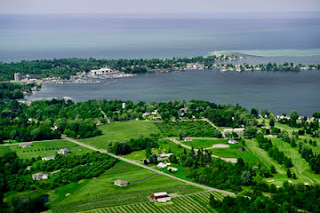 According to the New York State Department of Environmental Conservation (NYSDEC), Sodus Bay covers a surface area of about 3,357 acres and is located in the Towns of Sodus and Huron in Wayne County. This extensive bay supports an abundance of fishing, making it a popular year-round fishing destination with the local and out-of-county anglers. Summer bass fishing, ice fishing for perch, and spring bullhead fishing are popular angling activities. The NYSDEC monitors the fish species in the bay by implementing lake creel surveys, gill net sampling, and electrofishing. Field biologists are evaluating whether or not walleye stocking is effective, along with monitoring fish species and community populations. 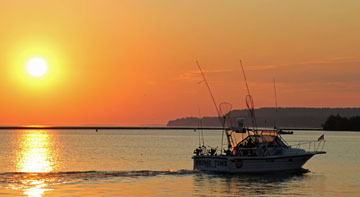 The bay supports a vast variety of fish including longnose gar, bowfin, northern pike, chain pickerel, channel catfish, brown bullhead, white perch, rock bass, bluegill, smallmouth bass, largemouth bass, black crappie, walleye, yellow perch, gizzard shad, and pugnose shiners. According to the International Union for Conservation and Nature, pugnose shiners are a threatened species due in part to habitat degradation. While the bay provides suitable habitat for native fish and plants, a number of factors, including AIS, are decreasing the water quality and suitability of the ecosystem to the natives. AIS such as Eurasian water milfoil, curly leaf pondweed, and European water chestnut are becoming nuisances to native plant species by outcompeting for resources. Sodus Bay is a tourism gem of the southern Lake Ontario region, important to both the environment and economy. Stewardship, research, education, outreach, and citizen awareness and interest are all important ways to help support Sodus Bay as a valuable resource for fishing, boating, swimming, and vacationing as well as its role in the local and Great Lakes ecosystems. To promote education and outreach of the effects of AIS on the bay, the organization, Save Our Sodus will be hosting their Citizen Science Expo from 9am to 1pm on Saturday, June 22 at the Sodus Bay Yacht Club at 7431 Irwin Street in Sodus Point. The event is free of charge, with interactive booths and displays to encourage questions and fulfill an understanding of the effects of AIS on Sodus Bay. For more information, visit the website at www.saveoursodus.com. This summer please take the opportunity to meet the NYSG Launch Stewards at Sodus Bay, Port Bay, and elsewhere in the shoreline region to learn about the voluntary watercraft inspections that help with AIS management. For more information on protecting native habitats against invasive threats, contact New York Sea Grant at 315-312-3042, SGOswego@cornell.edu. This is the first in a series of articles by the New York Sea Grant Launch Stewards. The stewards are college students helping to educate water users about how they can help slow the spread of aquatic invasive species as part of a statewide effort. 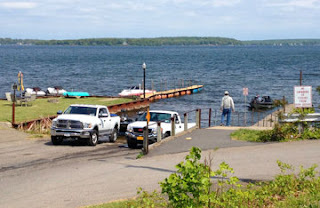 1 Comment to "New York Sea Grant Launch Steward Series: Sodus Bay"
A very worthwhile program. Let's hope the boaters see the value of getting this free inspection!